Home > technical	> Who’s Controlling The Controller? 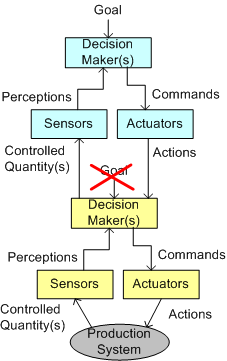 The figure below models a centralized control system in accordance with Bill Powers’ Perceptual Control Theory (PCT). 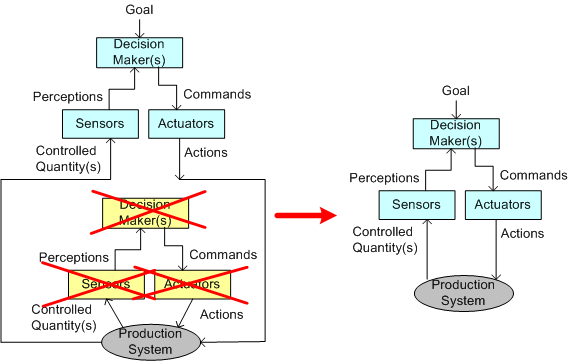 Given 1: a goal to achieve, and 2: the current perceived state of the production system, the decision-making apparatus issues commands it presumes will (in a timely fashion) narrow the gap between the desired goal and the current system state. But wait! 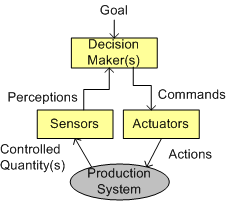 Where does the goal come from, or, in cybernetics lingo, “who’s controlling the controller?” After all, the entity’s perceptions, commands, actions, and controlled quantity signals all have identifiable sources in the model. Why doesn’t the goal have a source? Why is it left dangling in an otherwise complete model? Well, as Bill Clinton would say, “it depends“. 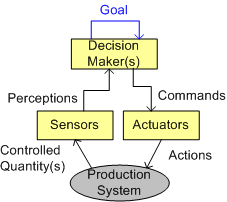 In the case of an isolated system (if there actually is such a thing), the goal source is the same as the goal target: the decision-maker itself. Ahhhh, such freedom. On the other hand, if our little autonomous control system is embedded within a larger hierarchical control system, then the goal of the parent system decision maker takes precedence over the goal of the child decision maker. 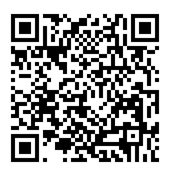 In the eyes of its parent, the child decision maker is the parent’s very own virtual production subsystem be-otch. To the extent that the parent and child decision maker’s goals align, the “real” production system at the bottom of the hierarchy will attempt to achieve the goal set by the parent decision maker. If they are misaligned, then unless the parent interfaces some of its own actuator and sensor resources directly to the real production system, the production system will continue to do the child decision maker’s bidding. The other option the parent system has is to evict its child decision maker subsystem from the premises and take direct control of the production system. D’oh! I hate when that happens. The figures portrayed in the blog post are not in accordance with Perceptual Control Theory. There are no “Decision Makers” in the PCT model, nor are any “commands” issued. You have either not read Powers’ books and articles or misunderstood them completely. You are of course free to draw flow charts as you wish, but please don’t label your made-up visualizations as being about PCT, which they clearly are not. Thanks for your opinion. I have read Powers’ book. This whole blog is about my visualizations and non-expert opinions. If you don’t like them, then you can move on.